Yoome cow leather daily leisure casual handbags have committed to serving the best handbag for women. The material is soft, and substantial. The hardware is high quality. It's both classic & chic. Yoome luxurious totes offer sophisticated style that's timeless. A roomy interior and multiple pockets will keep you organized. Available in versatile colors and shiny metallic shades, this backpack is sure to add a brilliance touch of flair to any outfit from every day to business wear. Comfortably holds an iPad Air,A4-size magzine, mobile phone, wallet, cosmetic, umbrella and other small things. It's can't avoidable that you will receive the bag with some smells from original material as it's brand new.The smell will be gone if place the bag in freely circulating air for 2-6 days. Three ways of using: With a removable shoulder strap, it can be used as a single shoulder bag, with two adjustable backpack straps, can be used as a backpack,with a top handle strap,it also can be used as a top-handle bag. Fashion PU leather,Good air permeability, high wear resistance, good moisture absorption. 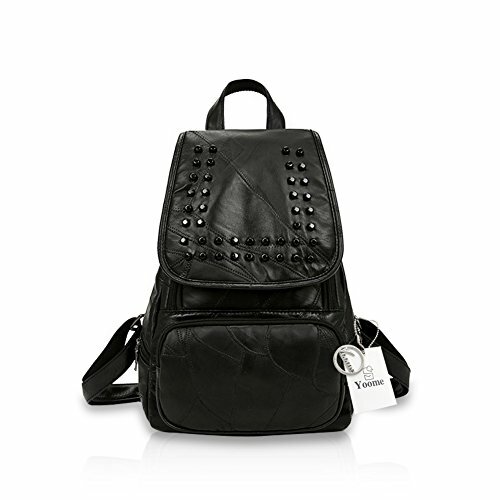 Material: High quality PU Soft leather, fabric-lined and Metal fittings.New fashion design,very popular,very flexible women's college wind backpack ,dacron lining material. The bag has two seperated pockets inside,and a zippered pocket as a interior compartment which will keep you organized.Contain ID card/mobile phone/wallet/zipper pocket,which can carry mobile phone,wallet,cosmetic,iPAD mini,umbrella etc. If you have any questions about this product by Yoome, contact us by completing and submitting the form below. If you are looking for a specif part number, please include it with your message.